"LEARN ASTROLOGY - IMPACT OF COMBUST PLANETS"
When the Sun is a functional benefic planet its conjunction with other well placed functional benefic planets is good and gives exponential growth for the significations of the planets in close conjunction with the Sun. The combust planets suffer under the triple transit influences of functional malefic planets. This can, however, be guarded by application of the strengthening and propitiating astral remedies, to a large extent. touched. When the Sun is a functional malefic planet or a functional malefic planet or planets are closely and mutually influencing the Sun, the significations of all the planets involved suffer in their sub-periods as also during transit impacts. 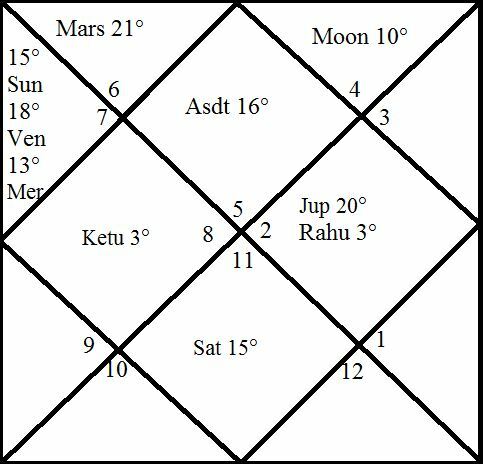 All the three planets in the third house are in close conjunction amongst themselves and the conjunction is good except the transit afflictions which will be short-lived if the influencing Rahu and Ketu during the transit do not become stationary. In this chart, the sub-periods of Venus, the Sun and Mercury in the main periods of the functional benefic planets will give good initiatives, increased income and happiness, involvement in writing, artistic pursuits, and status rise through such activities.